Cream butter and sugar till fluffy, add in eggs one at a time and beat in vanilla essence. Beat biscuit mixture into butter, alternating with the milk. Stir through milk chocolate chips. Spread batter into a lined tin and bake for 28-35 minutes. Allow cake to cool for 10 minutes before removing from tin and letting cool on a rack till room temperature. 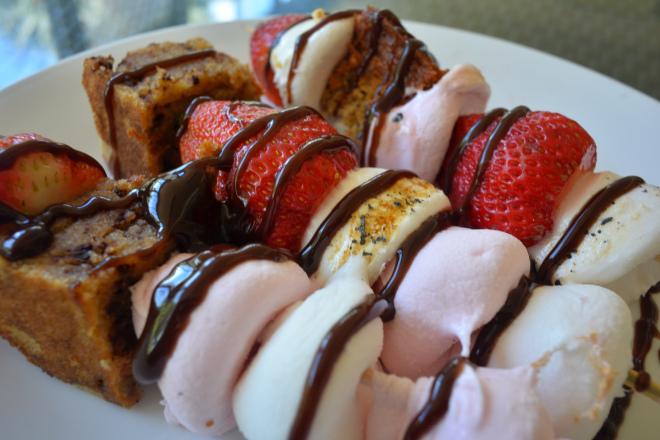 Place marshmallows on the skewer and toast over open top stove or fire. Squish down with a strawberry or a cube of cake. Place another marshmallow on top and repeat till fill skewer. 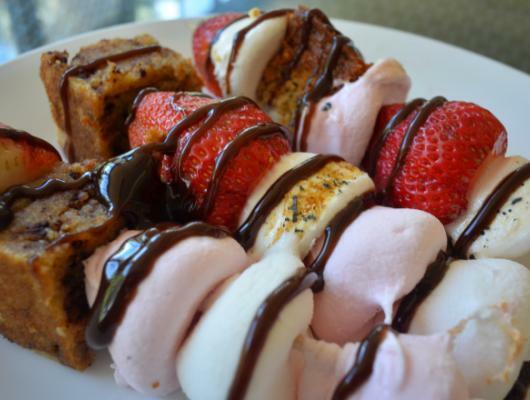 Traditional smores taken apart and put on a skewer - in the best way possible since it features a graham cracker cake and adds strawberries to the mix!